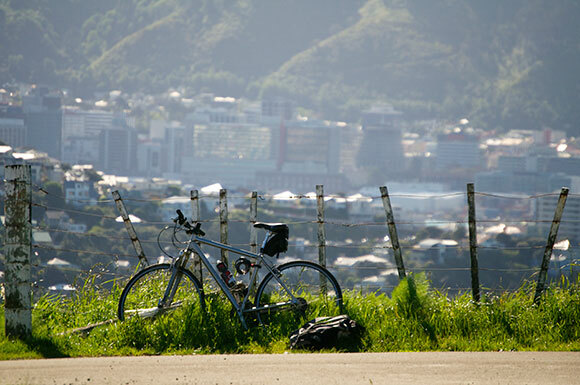 The Miramar peninsula in Wellington offers lovely riding whether you're on fat tyres or narrow, and no matter what type of cycling you're into. 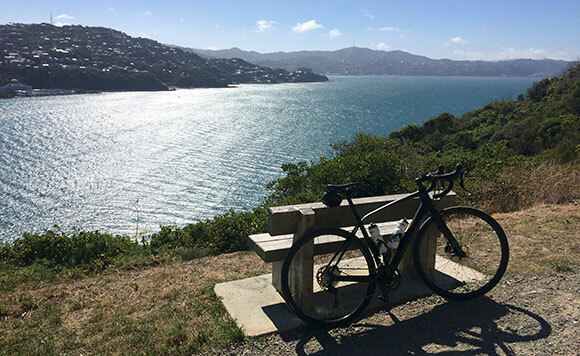 Running right round the peninsula and back into town, "round the bays" is the definitive Wellington road ride, showcasing an amazing variety of land and sea-scapes in a 40km paradise loop, starting and/or finishing at the beachfront Oriental Bay. The more adventurous can easily combine it with some hill riding in Polhill. What's not to like? 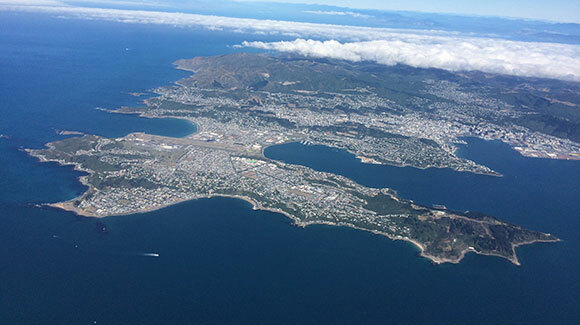 Round the bays is Wellington's classic short day ride. 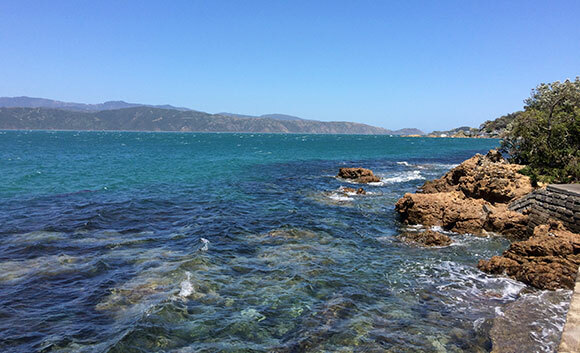 It's only 40km, accessible easily from the CBD, and takes you round many of Wellington's most charming seaside suburbs. It can be done in not much more than an hour if you cane it. However you tackle it you'll have a climb somewhere at the town end unless you cut out the southwestern bays of Owhiro and Island Bay; but don't do that, they're too pretty to miss. My favourite section is the northeast stretch, north of Seaton (Karaka Bays). Your main opponent on this ride is likely to be the wind. I usually ride it anti-clockwise, so the seaward section is ridden south to north - on a day with a stiff northerly, which let's face is quite often, the stretch coming up to the top of the peninsula is a grit-your-teeth-and-bare-it struggle to make much headway, but it doesn't last very long. The same's then true of the final leg from Greta point north. But these are small worries. The mapped route takes in the Aro Valley, climbs up to George Denton Park and goes along the Highbury Fling before descending Happy Valley Road to the coast. There's no need to climb up there if you don't want, or if you don't fancy a spot of singletrack; you can go straight up Brooklyn Hill (a lovely option if going this way is to turn left halfway up onto Bell Road and then take Heaton Terrace to Brooklyn shops). Once at the bottom of Happy Valley Road, turn left onto the coast road and follow that for 27km to Oriental Parade. If you haven't done it before, the ride will go quickly; it's beautiful, and even on a stormy day, it's invigorating. At Breaker Bay (kilometre 23 on the mapped route) the road goes up a short hill through the Pass of Branda. I've always assumed this place is named after the Pass of Brander, where Robert the Bruce finally blootered the MacDougalls of Argyll, after getting bored of picking them off one at a time, but who knows. The usual route from the top of the pass is straight ahead down to the coast again, but if you want, you can turn right here (down Mantell Street) and keep as close to the shore as possible. If you're really determined to follow the seashore, don't go through the pass at all; take to the beach at the start of it (Breaker Bay), where you can scramble through the arch and round to Churchill Park. One of my favourite rides in Wellington, although it's only 10km, is a visit to the former Miramar prison, following the curiously-named Main road (curious as there's never any traffic on it). It's absolutely lovely, and so is the short bike path that climbs up to it from Maupuia Road / Akaroa Drive. the mapped route turns left at the top, following Main road down to the Massey Memorial. It's not just a memorial - the former Prime Minister is actually interred here. I hope I'll be able to spend eternity in such a fine spot. I'm never sure about access to the section of Main road between the prison and the monument; the signage has been different every time I've visited, and I don't go there that often. These days I usually return via Nevay road. It's possible from there, just after you round the prison, to force a route down to the east shore of the peninsula through the Scorching Bay domain. You could en route visit the decaying Fort Ballance, built in the 1880s amidst fears that the Russians were about to invade NZ; but the state of this place is depressing. It's covered in graffiti. A half-hearted attempt to fence it off has had little effect; why can't we find these morons with the spray cans and sort them out? Wellington CBD from Main Road, climbing toward the old prison. Anybody can ride here, and any bike will do. Main photo: the bays. I mean, you would.